Pat pork dry. Melt reserved fat in heavy large skillet over medium-high heat. Add wine, stock (can substitute with sodium free chicken stock), onions, carrot and garlic and bring to simmer. Cover and cook 30 minutes, adjusting heat so cooking liquid is barely shaking. Add chestnuts and leeks to port. Continue cooking until instant-reading thermometer inserted in pork registers 170F and vegetables are tender, about 30 minutes; do not overcook. Strain liquid into heavy medium saucepan. Boil liquid until reduced to thin sauce like consistency; degrease. Return to vegetables. Slice pork and arrange around platter. Spoon vegetables and sauce into center and serve. Being raised in Paris, one thing that I loved and miss the most about winter, are roasting chestnuts on an open fire from street vendors. The smell awakens your senses and your want to have some. There is nothing more wonderful that to be holding this perfectly shaped cone of paper containing those preciously shaped brown morsels of love at each bite. You do not care how cold it is and that your gloves have to come off. 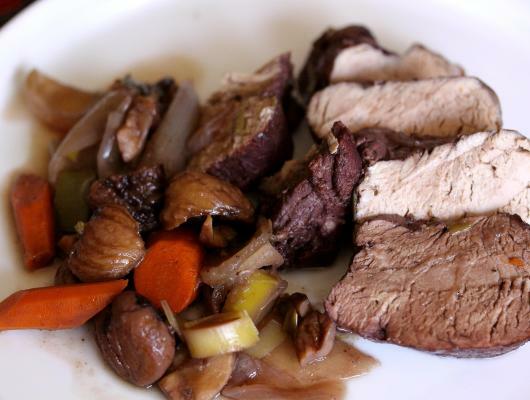 Farm-Style Pork with Chestnuts is one of the recipes that always graces our table in the winter months. 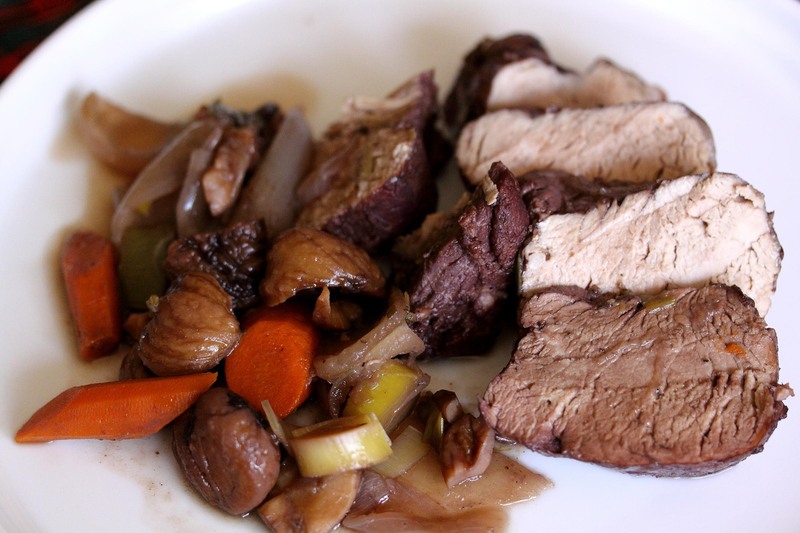 Chestnuts, pork tenderloin and wine all cooked together to gives us this delicious dish. Served alongside mashed potatoes and we are all in food heaven.